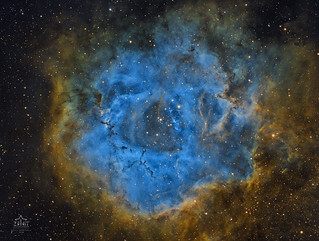 Finally I was able to process the shots I had done almost a year ago on the Rosette nebula. This nebula, catalog NGC 2237, with the open cluster NGC 2244 in the middle, is about 5200 light years from us. The stellar wind generated by this cluster causes a compression of the clouds, the Bok globes present around the cluster should have been generated by this pressure. There are 29 hours of integration, complete shooting data can be found in the photo info. 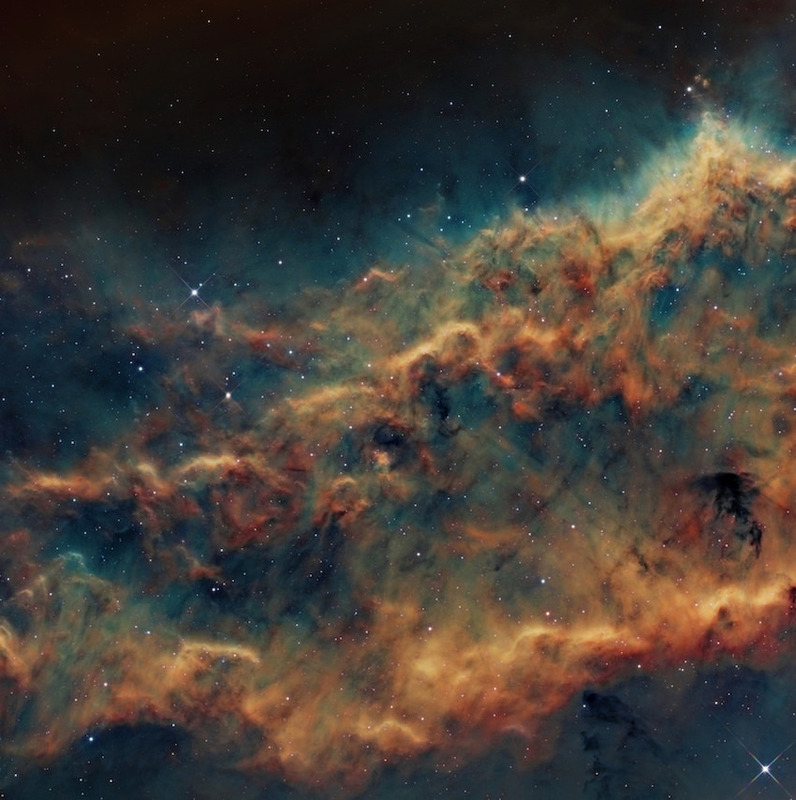 The piece of the nebula shown here is the dark, dense globule IC 1396A; it is commonly called the Elephant's Trunk nebula because of its appearance at visible light wavelengths, where there is a dark patch with a bright, sinuous rim. 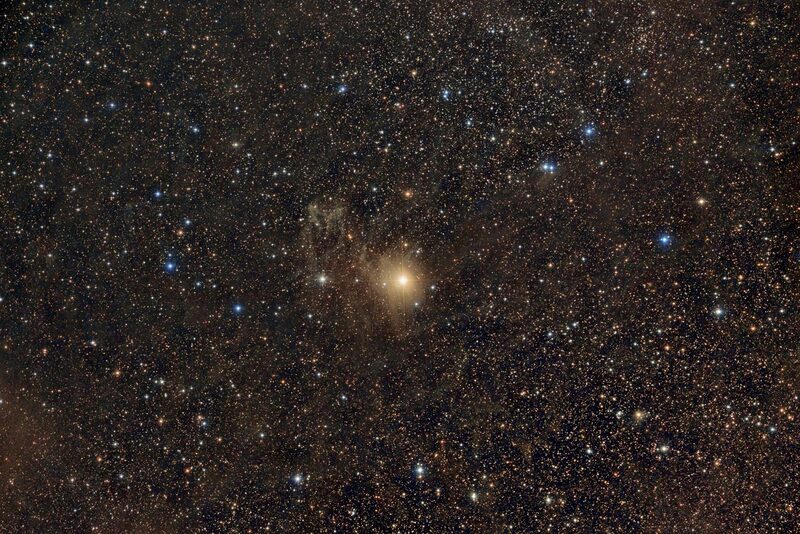 The bright rim is the surface of the dense cloud that is being illuminated and ionized by a very bright, massive star. The Elephant's Trunk Nebula is a site of star formation, containing several very young (less than 100,000 yr) stars that were discovered in infrared images in 2003. Two older (but still young, a couple of million years, by the standards of stars, which live for billions of years) stars are present in a small, circular cavity in the head of the globule. Winds from these young stars may have emptied the cavity. A hubble palette final version imaged from South Norfolk UK . Not in a favorable place for me as it passed above nearby roofsso i could do only up to 2 hours per session . Non the less i managed 2.5 hours each in both Halpha and O3. And 4 hours S2 . NGC 1499 Hubble Palette , 3 hours in each filter . On the night of August 11th I climbed up to a mountain hut in the French Alps. It took me about 7-8 hours to get to the hut with all my photography gear. I had planned this shot for more than 2 years. As you can see in the photo, The Perseids fly over the sky in the presence of Mars, Jupiter and Saturn. Also, you can see the highest mountain in the European Union, the always magnificent Mont Blanc, in the French Alps. Surrounded by two glaciers that converge a bit further down, you can see both of them in the image, the Mer de Glace which flows for a total distance of 12 kilometres, covering an area of 32 square kilometres in the central third of the Mont Blanc massif. On the left hand side you can spot the Leschaux Glacier and its hut (the light just next to the glacier). In addition, if you take a deeper look, just below the Grandes Jorasses mountain range you will be able to spot climbers trying to summit the mountain with the first lights (you can see their headlamps). As always, we were gifted with an spectacular perseids show at almost 3000m high. Last edited by bystander on Fri Nov 23, 2018 2:38 am, edited 2 times in total. Last edited by bystander on Fri Nov 23, 2018 2:39 am, edited 1 time in total. 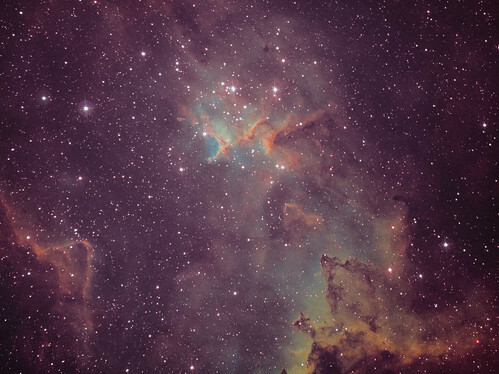 Melotte 15 is an open cluster of bright stars located at the center of the Heart Nebula (IC 1805). Named for its discoverer, Philibert Jacques Melotte (1880-1961), the grouping of O-type supergiants is only about 1.5 million years old. "O" stars are the brightest and most massive known, about 20 to 100 times larger than the Sun! The lifespan of these hot, blue stars can be as short as 3-6 million years. Melotte 15 is about 7,500 light years away from Earth. NGC 7635, also known as the Bubble Nebula, Sharpless 162, or Caldwell 11, is a H II region emission nebula in the constellation Cassiopeia. 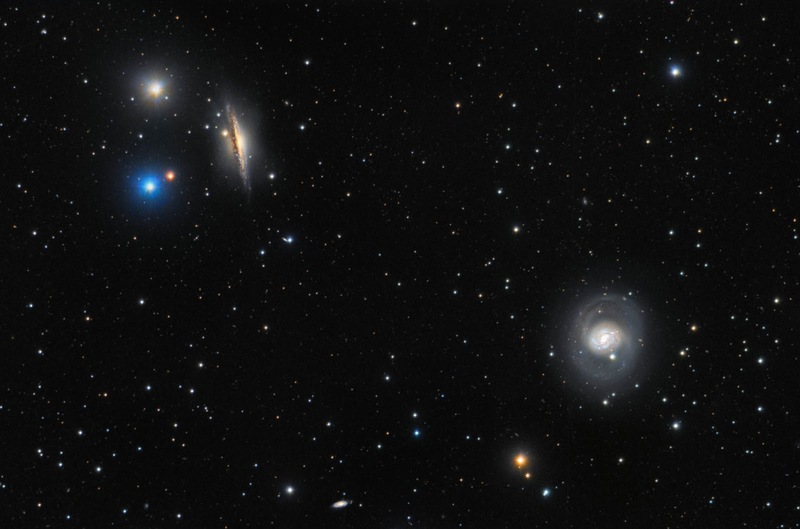 It lies close to the direction of the open cluster Messier 52. 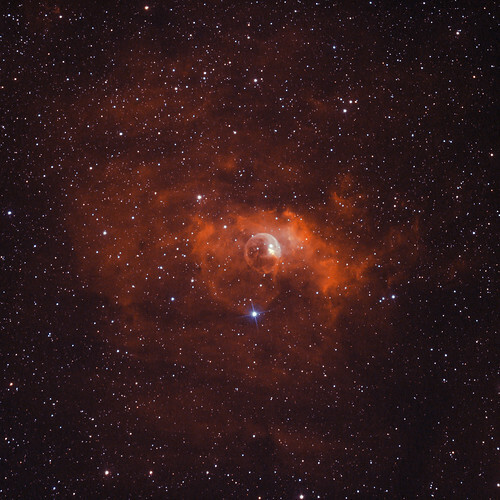 The "bubble" is created by the stellar wind from a massive hot, 8.7 magnitude young central star, SAO 20575. The nebula is near a giant molecular cloud which contains the expansion of the bubble nebula while itself being excited by the hot central star, causing it to glow. It was discovered in 1787 by William Herschel. Tecnosky AG70 F/5 su ASA DDM60PRO con Autoslew e Sequence. Finn is my little nephew who turned 2 today. To honour him I named the nabula that way. 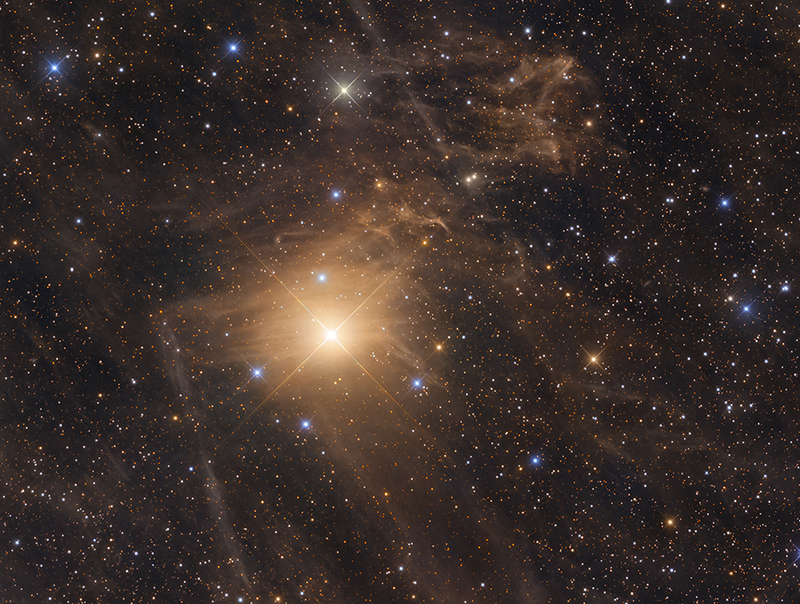 Finns Nebula is an unknown and uncatalogized reflection nebula around the variable star BE Cam (V* BE CAM, HIP 17884) in the constellation Camelopardalis. It has never been photographed before. 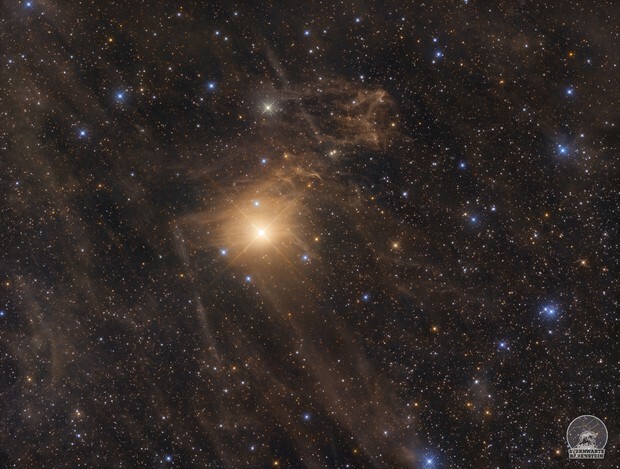 The object is a very rare orange-yellow reflection nebula of the Merope type, because it reminds optically strongly of the nebula around the star in the Pleiades. Because Finns nebula is located around a variable star, its brightness varies periodically analogous to its central star. This makes Finns nebula an extremely rare yellow, variable reflection nebula. With an extension of 30-40 arc minutes, Finns nebula is very large, but extremely weak in brightness. 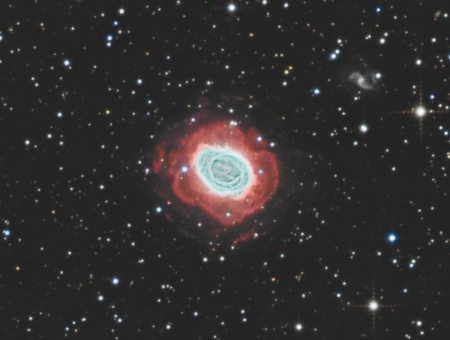 The photo was taken on my backyard observatory in Saxony/Germany. Last edited by Marcel_Drechsler on Mon Nov 26, 2018 10:24 am, edited 2 times in total. Last edited by bystander on Mon Nov 26, 2018 3:37 pm, edited 1 time in total. The highest resolution picture (more than 100 mega pixels) is available on request. Many Thanks to Marcel Drechsler, who told me very early about his discovery. So I could use the good weather for my own picture. This is only 80 x 3 minutes, only 4 hours with my ASI094 at my RASA. So again thanks and congratulations to Marcel. The deadliest fire in California's history that devastated the north for more than two weeks is now "100%" under control, US firefighters said Sunday. So tribute to the victims, American peoples and fire fighters with the nebula of California. We all have a thought for them. That's a lovely picture of the Milky Way center and upper Scorpius! The details are great, and the colors are fantastic. Some people might think that the colors are a bit too saturated, but I love them. And look at all the details! Look at the "blue horse" in all its glory at one o'clock! Look at the pink emission nebulosity surrounding Delta Sco (to the right of the blue horse) and Pi Sco (below Delta). 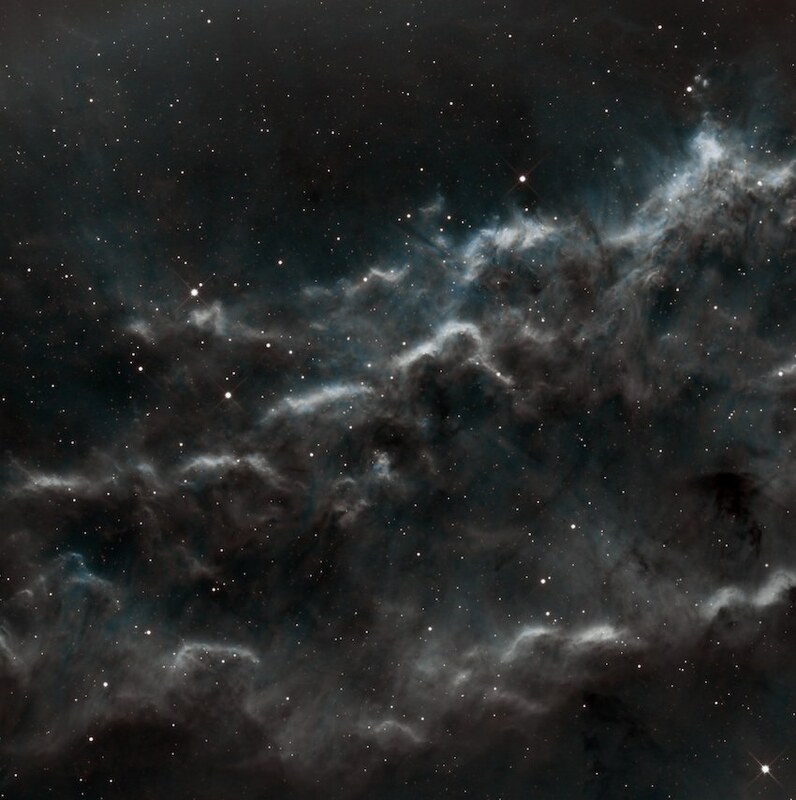 Look at the intricate blue reflection nebulosity below and to the right of Pi! Look at the large rectangular splotch of pink emission nebulosity surrounding Tau Sco, below the yellow reflection nebula surrounding Antares. And look at all the details in the dark dust columns rising from the disk of the Milky Way, and look at all the details and the nebulas in the central dust lane of the Milky Way! Finally postprocessed my closeup of the Pleiades, done with a 10inch Newtonian reflector and full format DSLR. Fine details are shown including the little edge-on galaxy PGC 13696 right of the star Electra.